run, zoe, run! : Run Wild 8K Recap...yes! I can't even CONTAIN my excitement and thankfulness and happiness (and all the -nesses out there)! Soooo, I was the FIFTH woman overall! I was in the top 5! EEK! And not only that, but I was #3 in my division!!! YES!!!! Can you tell I'm happy? Naw, didn't think you could. So very awesome that they braved the icky fall weather to watch us run. I feel so loved and blessed to have cool friends and family! The start of the 8K and 5K races, with some eager cheerleading by family/friends. Apparently I'm too quick to be captured on video, that and Trav doesn't seem to know what he's doing with the new camera. Oh well, there was me...for a brief second. Liz finishing her race! She was amazing!! At the end of the race, I totally sprinted next to this dude that did not want to be passed by a "Skirt"...he ended up beating me, but only very very slightly. Ha ha! At least I snuck up on him from behind. But, either way, it was fun sprinting the finish in the mud! You are so awesome and wonderful! niiice! name on the main screen! congrats on 5th overall and 3rd ag! 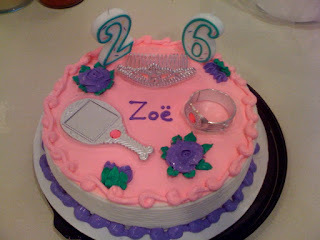 love the bday cake, haha. Congratulations on a great race! And what's that wet stuff all over? We here is Southen California haven't seen that stuff since last winter! That is AWESOME! Happy birthday and WAY TO GO! Bless my heart a local runner and Blogger!!! YIPPEE!! This race was a fun one. I took second overall for the 5K... not sure how I would have done in the 8K. I plan to do it next year. Was hubby's first race. Very excited to meet a local. I am still debating on if I will run Seattle.